TORONTO (AP) — Auston Matthews says the last month was torture watching his Toronto Maple Leafs. The 21-year-old American was exceptional himself early with a goal and an assist on two power plays before adding the exclamation point on a third-period deflection to help Toronto pull even with surprising Buffalo atop the NHL’s overall standings. In between, however, Matthews didn’t think he was all that impressive in his first game back playing on a line with speedsters Kasperi Kapanen and Andreas Johnsson. Matthews sat out 14 games after taking a clean hit from Winnipeg’s Jacob Trouba on Oct. 27. He had 10 goals and six assists in the first seven games of the season, but was held off the scoresheet in three consecutive outings before getting hurt. He made an almost immediate impact against San Jose, taking a pass from Marner and finding Tavares at the edge of the crease on a power play at 3:38. 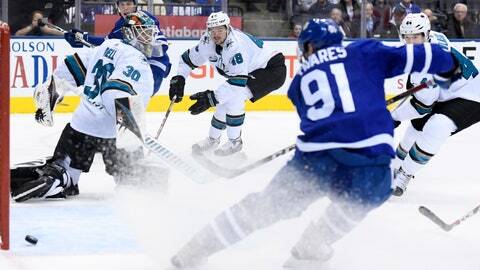 San Jose got that one back at 10:40 when Hertl banged the puck past Andersen after Leafs defenseman Travis Dermott could only partially block Kevin Labanc’s pass in front on a Sharks’ man advantage. The Maple Leafs regained the lead just 39 seconds later on another power play when Matthews ripped his 11th upstairs short-side on the helpless Dell. Toronto’s power play connected a third time in three successive chances, this time with the No. 2 unit, at 1:53 of the second when Marleau took a clever pass from Johnsson and fired upstairs on Dell for his sixth and Toronto’s third goal with the man advantage against the NHL’s top penalty killing unit. The 39-year-old Marleau, who played 19 seasons with the Sharks, scored against San Jose for the first time, giving him at least one goal against all 31 NHL franchises. Matthews put the game out of reach for good with his 12th midway through the third when he tipped Johnsson’s shot past Dell’s glove. Notes: Matthews has scored in all four career games where he’s returned from an injury. Toronto was 9-5-0 without Matthews and is 10-3-0 overall in its last 13 games. … Erik Karlsson, who was traded from Ottawa to San Jose in an eight-player blockbuster deal in September, will play his first game back in Canada’s capital on Saturday.